For the last few days, there has been a lot of focus on the federal government shutdown. National parks and non-essential government employees have felt the effects of this shutdown. Like it or not, many are speculating that the government shutdown could continue for at least a few days or even weeks. 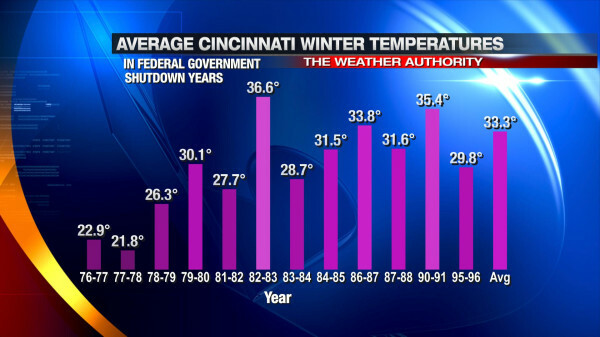 With all of the focus on the consequences of the shutdown, I thought I would try to lighten the mood and see if there was a correlation between a government shutdown and how much cold and snow Cincinnati got in the winter that followed. Ian Livingston of the Washington Post’s Capital Weather Gang looked at a similar correlation (just for the Washington D.C. area), so I tip my hat to him for this idea. 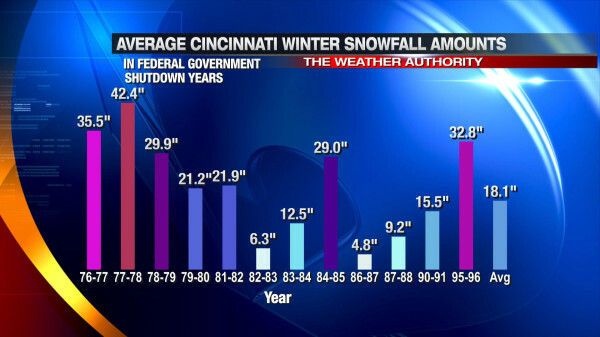 In the modern era (since the mid 70s), Cincinnati winters that follow a federal government shutdown are usually colder, snowier, or both colder and snowier than average. For the sake of this discussion, “winter” is considered to be “meteorological winter,” or December, January, and February only. Only 3 out of the 12 winters shown above were warmer than average. Note that the second coldest and coldest winters on record (1976-1977 and 1977-1978, respectively) are listed. The average of all of the “shutdown winters” above is roughly 3.2° below average, although the brutal winters of 1976-1977 and 1977-1978 pull the average down significantly; without these two years included, the “shutdown winters” average is about 1.7° below the seasonal average. Only 7 out of the 12 “shutdown winters” above were snowier than average. The average of all of the “shutdown winters” above is roughly 3.7″ above average, although the brutal winters of 1976-1977 (5th snowiest all time) and 1977-1978 (snowiest all time) pull the average up significantly; without these two years included, the “shutdown winters” average is only 0.2″ above the seasonal average. 7 of the 12 “shutdown winters” were both colder and snowier than average. Of course, this exercise is all for fun. A government shutdown does not mean we will get a certain type of winter. A winter forecast will be developed in the days and weeks to come; look for it later this year.